Back in May I received an impromptu tour of Salomon HQ because, you know, I just happened to be in Ogden, Utah. In any case, my buddy Mike grabbed a shoe off their demo shelf and said, “You’re going to want to see this.” As he explained this bright orange shoe, his statement only got more and more correct. My only response was “size 11, please” and a beautiful relationship was born. 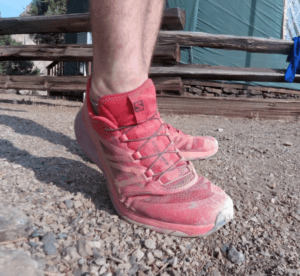 Salomon is a brand that has always drawn lots of curiosity, but some people have felt certain models may be too narrow or too firm or have been wary of the heavy price tag. The evil geniuses in Annecy, France set out to change all that with the Sense Ride. The overall function of the shoe is versatility and adaptability. 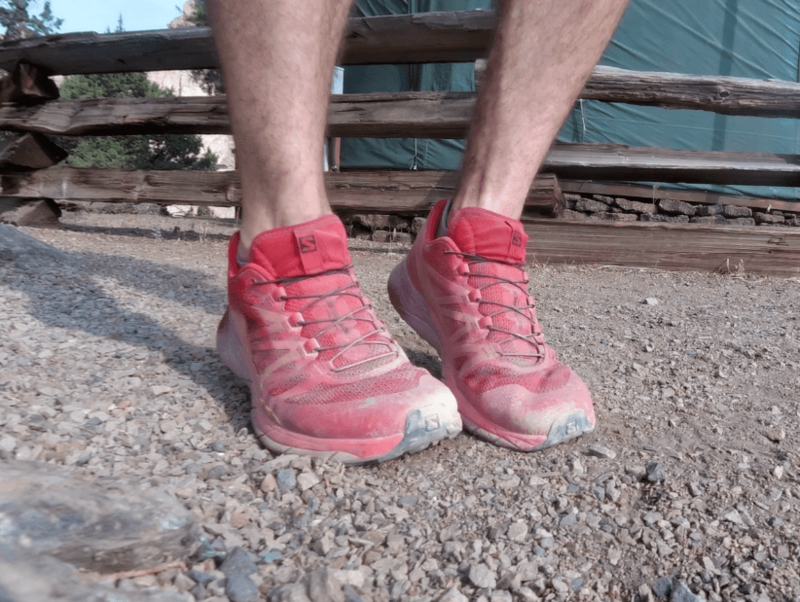 Over the last year we have seen advancements in the rubber used for the outsole of Salomon trail shoes. 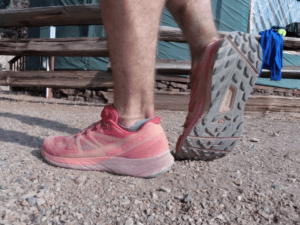 They have finally found a cost-effective way to produce the elite-level sticky rubber and have now introduced it in shoes like the Speedcross 4, followed now by the Sense Ride. The configuration of the lugs was designed so that the shoe excels on packed trails or in moderately soggy conditions. If it’s a mud-fest, not much can save you, but wet or dry won’t be a problem. Multidirectional lugs allow for easy climbing and control on down hills. Those that went to Salomon Mike’s trail demo got a chance to experience what it’s like to “embrace the downhill”. This shoe is entirely in promotion of that concept. No need to worry if you’ll have control underneath you; this shoe will be there. In regards to underfoot feel, it’s really smooth. An 8mm heel to toe offset is slightly below the traditional build of the Speedcross, but still slightly more than the Sense Pro. And that makes sense, given this is a bit of a blend of the two. The material is a blend of cushioned material as well as responsive material and you can actually feel the effectiveness of both! This is an underfoot that will appeal to the masses, and not just the elite’s feet. Speaking of being designed for the everyday runner, the fit is much more relaxed than we have known Salomon to be in the past. Individuals, such as myself, with feet that are a little on the wider side will have a much easier time being accommodated in this particular model. The thick, padded liner would also easily swap for a Superfeet or custom insert, if that’s what you typically wear. And to add, the seamless bootie construction makes the Sense Ride hold true to the classic Salomon snug midfoot. This is not a truly wide fitting shoe, but it is more generous for those who need or prefer a slightly more relaxed fit. It may be bold to say, but this is an early pick and definite contender for 2017 Best Debut shoe. The only big drawback for me is the lack of forefoot rockplate. The padded cushion does make the Sense Ride protective, however. And this lack of rockplate makes the shoe feel more like a road shoe with gnarly treads. All that adds up to a pretty rockin’ winter in New England shoe, though! It still feels smooth on roads with the flexible padding, and the treads would be awesome for on and off hard packed snow. But until snow starts to fall, this is certainly one to easily handle your North Shore favorite trails and beyond!